Maggie, the inspiration for the CSU’s Hound Hugs and Kanine Kisses title, gives another one of her trademark hugs and kisses. 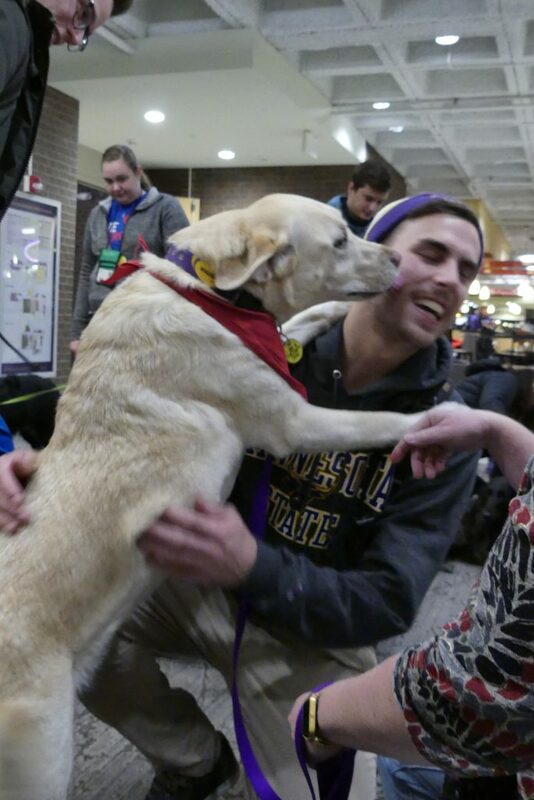 After several semesters offering therapy dogs as part of the Centennial Student Union’s Finals Week StressBusters, the tradition has grown and evolved into ongoing monthly Hound Hugs and Kanine Kisses program now being copied on other Minnesota campuses. The Finals Week edition of Hound Hugs and Kanine Kisses will be Monday, Dec. 10, from 11 a.m. to 1 p.m. and 6:30 to 8 p.m. Both sessions are in the CSU Lincoln Lounge. Lenny Koupal, CSU communications coordinator who oversees the therapy dog sessions in the CSU, said therapy dog visits started in 2012 to help students through stressful Finals Week. 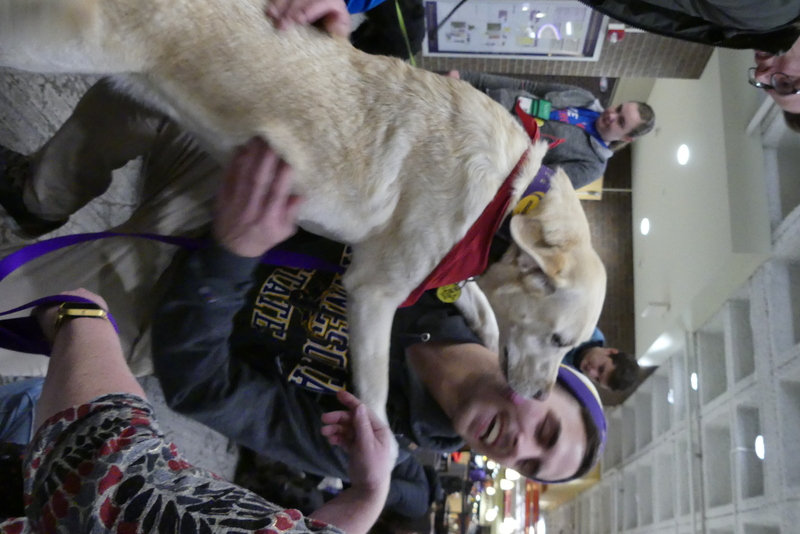 In response to students’ request seeking more frequent visits, Fall and Spring sessions of Hound Hugs and Kanine Kisses are planned in the CSU every third Thursday of the month from 6:30 to 8 p.m. in the Lincoln Lounge. Koupal said Cathy Colby, a member of the University’s IT staff and volunteer with the local therapy dogs organization, helped get the monthly sessions started. “Cathy – and her French bulldog Gizmo – really made this happen. Other members were invited with many of them becoming monthly regulars,” Koupal said. Inspiration for the Hound Hugs and Kanine Kisses label came from one of the therapy dog regulars. Others who have helped promote the program on campus are faculty such as Dr. Mary Kramer, professor with the Health Science Department. For Health 101 classes, students can complete an out-of-class assignment by attending therapy dog sessions and sharing personal observations. “Faculty have shared students’ reports of the evening. Some of them are quite moving with the therapy dogs helping homesickness, classroom stress and general anxiety,” Koupal said. Kramer said the student reflections have interested her and fellow professors in possible research into the emotional impact of therapy dogs on college students. Other area colleges offering therapy dogs include a new monthly Sunday program at Gustavus Adolphus in St. Peter. Koupal said other schools within the Minnesota State system expressing interest in similar therapy dog sessions include Hennepin Technical College and Anoka-Ramsey Community College. Koupal said what started as a Finals Week program will continue to meet student needs. A recent CSU student survey showed therapy dog sessions were the third most popular reason students come to the CSU.